Volcanoes National Park – Travel Guide, Map & More! 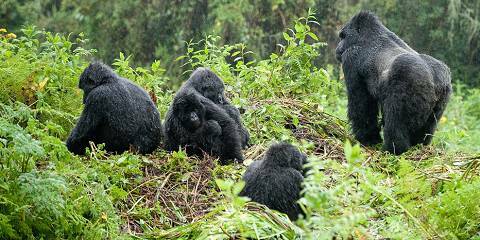 Volcanoes National Park (also known as Parc National des Volcans) is arguably the best place in the world to observe the critically endangered mountain gorilla. 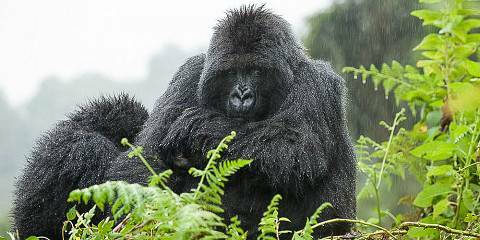 Dian Fossey started the habituation of these gentle giants decades ago, and today there are 10 habituated groups, visited daily by small numbers of people. Other activities in the park include golden monkey tracking, a hike to Diane Fossey’s former camp, and the more strenuous hikes to the summits of the Muhabura, Gahinga, Karisimbi and Bisoke volcanoes. Aside from mountain gorillas, a habituated troop of golden monkeys can be tracked. This rare species is an Albertine Rift endemic. Buffalo and elephant are quite common in the forest, but they are skittish and rarely seen. Smaller animals present include bushbuck, bushpig, giant forest hog, black-fronted duiker and spotted hyena. Volcanoes National Park protects the Rwandan sector of the Virunga Mountains, a range of extinct and active volcanoes that straddle the Ugandan and Congolese borders. The dramatic scenery consists of a chain of free-standing mountains, each connected by forested saddles. The gorillas are often found along these forested saddles, in enormous groves of bamboo. Due to the mountain peaks and general high altitude, Volcanoes NP has a damp, cold climate. It rains throughout the year, but there is a drier period from June to August. Due to its location near the equator, temperatures don’t vary much throughout the year. Daytime temperatures average 16°C/61°F, but this drops to about 6°C/43°F at night. Waterproof, warm clothing is necessary throughout the year. 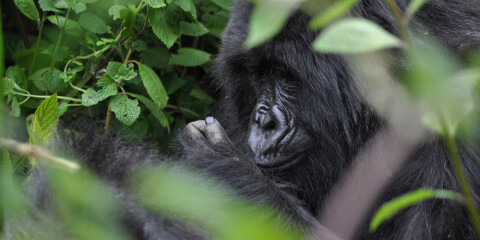 Gorilla tracking is offered throughout the year. Sightings are almost guaranteed and are not weather dependent. However, the drier months, from June to August, offer the best hiking conditions and these are the prime months for gorilla tracking and other hiking trips in the volcanoes. The trails can be slippery throughout the year and good hiking shoes are recommended. Want to Visit Volcanoes NP?